Taunton, 61 @ Attleboro, 64 – Final – A back and forth fourth quarter ended with a big three from Jake Dunkley and a key free throw as the Bombardiers scored their first win over Taunton since Valentine’s Day 2013. Dunkley finished with a game-high 20 points while Kyle Murphy, Andrew Milliken and Lucas Boucicaut each had 12 points. Carlos Borrero led Taunton with 17 points while Jose Mercado added 13 points. Oliver Ames, 39 @ Foxboro, 47- Final – Jason Procaccini’s 15 points was a game-high as Foxboro grinded to a win to clinch at least a share of the Davenport division title. It marks the program’s first ever Davenport title and first league title since 2003. Charlie Ryan had 12 points for Oliver Ames. Mansfield, 55 @ Franklin, 51 – Final – Franklin rallied from a 15 point second half deficit to get within two in the final minutes but a big shot from Mansfield’s Matt Ehrlich and key stops sealed the win for the Hornets. Tyler Boulter had a team-high 12 points while Sam Goldberg had 11 points, seven rebounds and three assists. Matt Ehrlich (four rebounds, four assists) and Christian Weber each had nine points, Nick Baskin had six and Max Boen had five points and four assists. Franklin sophomore Connor Peterson scored 21 points and hauled in nine rebounds while freshman Jay Dieterle netted 18 points. King Philip, 38 @ North Attleboro, 49 – Final – Mario Bresko led the Rocketeers with 12 points. Stoughton, 53 @ Milford, 59 – Final – Dimitry Torres once again led the way for the Scarlet Hawks, dropping in a game-high 21 points. Zack Tamagni added 13 points while Anthony Arcudi chipped in with 19 points. Dwight Anderson had nine points and 10 rebounds while Kayden Kelley added 10 rebounds. Stoughton sophomore Cam Andrews had a team-high 18 points. Canton, 43 @ Sharon, 67 – Final – Charlotte Ransom scored 19 points and six rebounds for Sharon. The Eagles also got a career-high 18 points from Emma Eberhardt and 16 points and five rebounds from Alyssa Piazza. 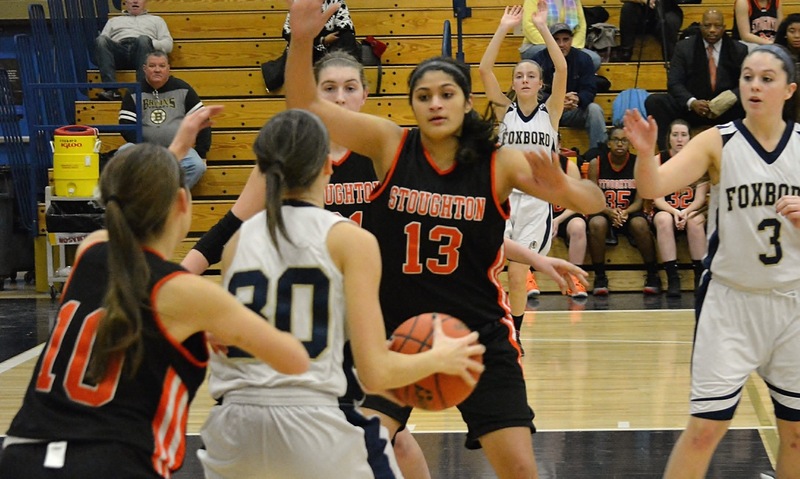 Foxboro, 40 @ Oliver Ames, 55 – Final – Niyera Mitchell came off the bench for OA to score 15 points and pull down 17 rebounds, both of which were game highs. Kayla Raymond added 11 points and 10 rebounds and Francesca Calabraro scored 11. 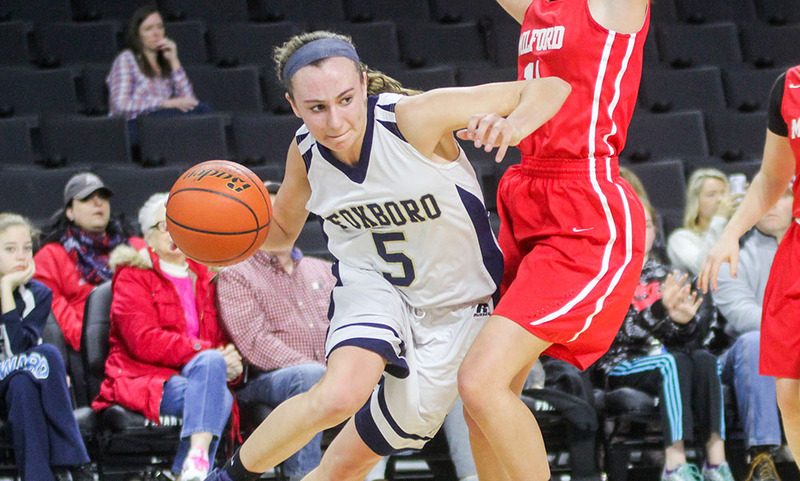 Ashley Sampson was the top scorer for Foxboro with 15 points, including 10 in the fourth quarter, and Cassidy Harrison added 12. Franklin, 38 @ Mansfield, 44 – Final – Meg Hill and Caroline Maher led the way for Mansfield with 12 points apiece. Lauren Rudolph was the top scorer for Franklin with eight points. 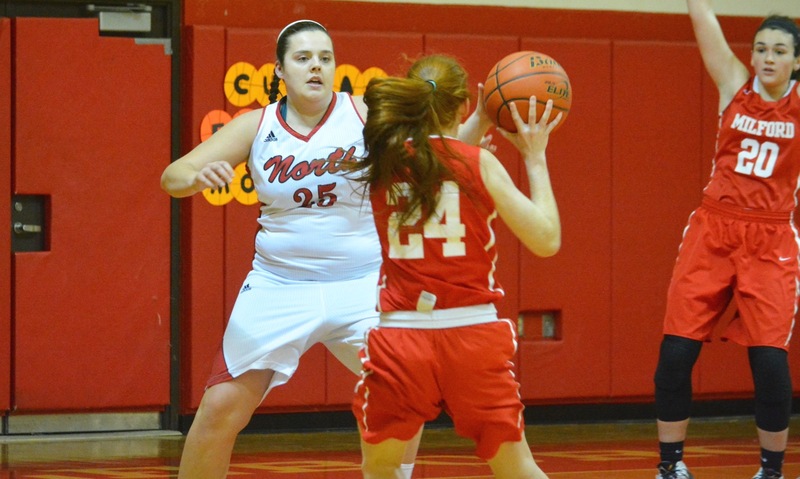 North Attleboro, 60 @ King Philip, 35 – Final – Caroline Collard and Ashley Ahern each scored 13 points for the Rocketeers. Riley Dalzell led the Warriors with 13 points. 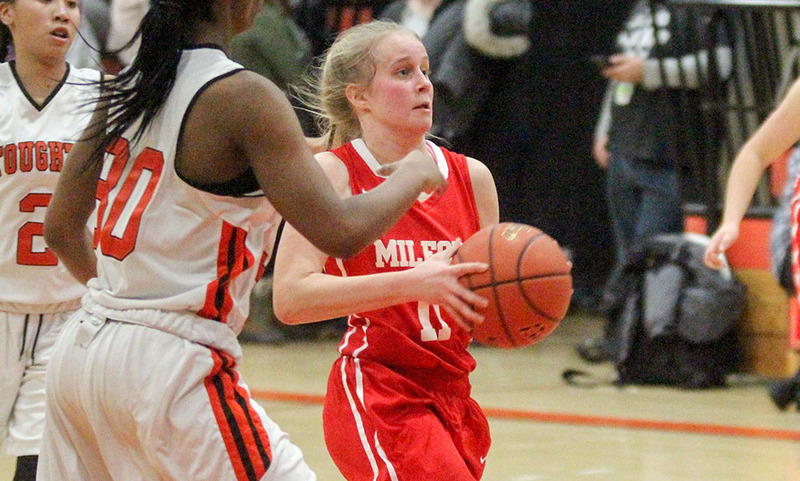 Milford, 59 @ Stoughton, 41 – Final – Christine Pye was the top scorer for the Hawks with 14 points, while Jill Powers chipped in with 10. Attleboro, 63 @ Taunton, 30 – Final – Emily Houle scored 31 points to lead the Bombardiers and is now only 21 points away from 1,000 for her career. There has been significant progress made in the three years that Jim Choquette has been in charge of the program and he is hoping that this year “will be another step forward” for the Bulldogs. Canton comes into this winter with momentum after winning four games down the stretch of last season and, as Choquette explained, narrowly missing out on a handful of other wins. Senior captains Meaghan Hunter (who did not play high school basketball until her sophomore year) and Shannon Foley will be the leaders of the team and counted on to get the team into its offense. Junior Emma Murphy is back for her third season on varsity and she continues to develop as a post player. As Choquette noted, Murphy has already started 40 games in her Bulldogs career, so experience is not an issue. Junior Casey Shea will join Murphy in the post and she is another player that continues to develop. 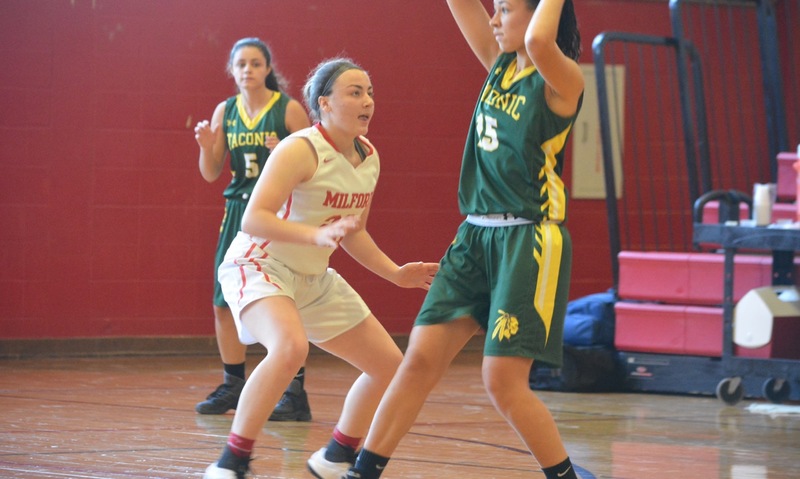 Sophomore Hannah Jerrier had a big season with her AAU team at Mass Premier and Choquette thinks that she is primed for a breakout season along with classmate Jess Powers, who emerged at the tail end of last season. The Bulldogs will also look to incorporate a pair of freshmen into the system with Erin Devine, who Choquette said has already grown to 6-foot-3, and incoming point guard Julia Hamilton, who may be a star in the making. Experienced is not generally an adjective used when describing a team that is going to start four sophomores at the beginning of the season, but all four of the underclassmen in Foxboro’s starting lineup saw significant playing time during the Warriors’ run to the sectional final last year. With HockomockSports.com Player of the Year and Hock MVP Kat Tamulionis graduated, the ball is now going to be in the hands of these young players and they will be given every opportunity to produce. The primary ball-handler will be sophomore Ashley Sampson. Sampson had a breakout rookie season in which she became one of Foxboro’s best weapons off the bench and showed no fear against even the best teams in the league and the state. Classmate Lily Sykes will join her in the backcourt and adds another good shooter and defender at the guard position. Cassidy Harrison will be the lone senior in the starting five and will provide shooting on the wing. Sophomore Grace Tamulionis showed tons of potential last season and is a versatile forward that can step back and shoot and has the size to crash the boards. She will be joined in the post by classmate Shannon Smalley, who head coach Lisa Downs said had a great summer. Downs also noted that junior Lauren Flahive could come off the bench as a defensive option and senior Carolynn Will is another option as a shooter at the forward position. Milford enters a new season with a new coach. T.J. Dolliver moves into his first head coaching position at the high school level, after being an assistant for boys’ coach Paul Seaver, and he is “excited” by the potential that the Hawks have shown in the opening weeks of practice and during the opening game of the season (a 44-21 win over Hopedale). There is only one senior on the roster, but the Hawks gained a lot of experience last year. The focal point for the Hawks offense (and for opposing defenses) will be sophomore guard Kate Irwin. The dynamic lefty has quickness, vision, and shooting touch and she provides Milford with a spark on both ends of the floor. She will get plenty of help from junior forwards Nicole Dahlgren, Christine Pye and Brianna Croteau. The lone senior on the roster is Jill Powers, who knocked down a couple of threes in the season opener. Sophomore forward Gill Valanzola will add depth at the forward position and junior guards Emma Liskov and Jill Burley will give Irwin help in the backcourt. Dolliver is also hoping to get sophomore Emily Piergustavo back at some point this season to help the Hawks spread the floor with her shooting. The Tigers finished second behind Foxboro in the Davenport last year and expectations are high that this Oliver Ames team will challenge the Warriors again this winter. Team chemistry seems to be as high as ever in the Tigers group with a smaller roster of just nine players that have battled illnesses and other obstacles during the two weeks of preseason practice. Head coach Laney Clement-Holbrook is hoping that her team will rally around each other and can make a good start to the season. Although she has missed a few days of practice with illness, junior Francesca Calabraro is going to be the player that OA counts on the most this season. Calabraro was the team’s leading scorer last season and also one of the league’s best in picking up steals. Calabraro is lethal on the break and that is a key to how the Tigers like to play. Sophomore Kayla Raymond, who saw plenty of time as a rookie, has shown the potential of being a top scorer and a force on both ends of the court. Senior captain Kaitlyn McCarthy was credited with holding things together for the Tigers during the tumultuous opening weeks of practice and she is joined in the leadership role by fellow captain Sam Bamford who is a tenacious defender at the point guard position. Junior forward Niyera Mitchell gives the Tigers size and athleticism in the middle. Hannah Carroll and Abby Reardon will add depth at the guard position. In his first season in charge, Cliff Tomassian took over a program that had reached the sectional final at UMass Boston for the first time in decades but one that lost its three best players including HockomockSports.com Player of the Year Karlie O’Driscoll. The Eagles were competitive throughout the season, particularly on defense, but struggled on the offensive end and missed the tournament, something Tomassian believes can change this winter. Sophomore guard Shira Stoller will also be back this year and Tomassian has urged the point guard to look for her own shot more and take some of the pressure off Piazza. With a point guard that can get to the basket and a forward that can score in the post, the perimeter should open up for Sharon and that is where seniors Ashley Mukasa and Charlotte Ransom can excel as spot up shooters. After three decades in charge, Janet Sullivan stepped down as the head coach at Stoughton and the program turned to someone who knows all about the program to step in this winter. Former Stoughton player and 1,000 point scorer Charmaine Steele-Jordan, who played at Quinnipiac and was an assistant coach at Boston University, takes over and had already brought a buzz to the Black Knights heading into the season. “There couldn’t have been a better place to fall,” said Jordan about the chance to take over at her alma mater. Senior Alecia Quinones gives Steele-Jordan a weapon to work around. The forward has the size to match up with opposing post players and the athleticism to match up with wings. On offense she also adds versatility with an improving jump shot and good moves on the block. Fellow senior Jess Greer is the primary ball-handler and can also knock down the three. Senior forward Ava Seigel is the third captain this season and is another important cog on both ends of the floor. Senior Bridgette Whalen and sophomore Valerie Whalen will add more size and strength in the paint for the Black Knights. 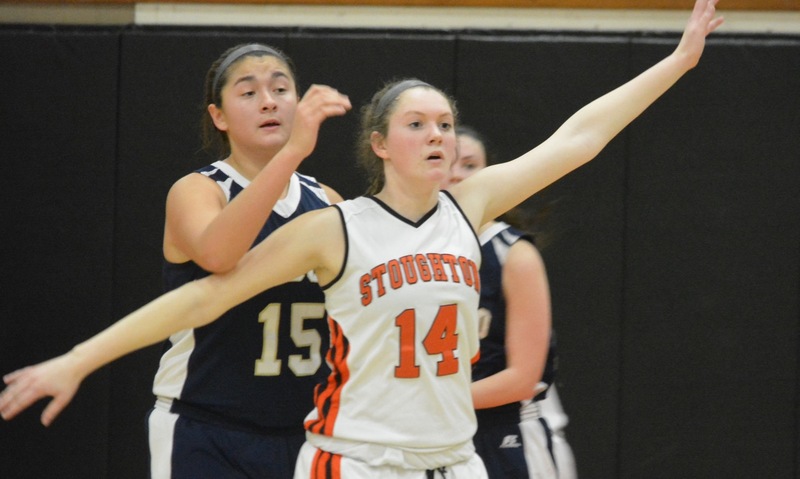 Defense was always a strength of Stoughton and that will certainly continue under the new coach. For a list of 10 Players to Watch in Hockomock League girls’ basketball this season, click here.